Agents love to tell you that Winter is a great time to sell - because there are less properties on the market therefore less competition. CoreLogic assessed seasonal trends with property settlements over the last 30 years, and and whilst Summer is the least popular (owing perhaps to the holiday season), Winter is definitely behind Spring and Autumn. If you are considering selling your property this Winter, there are some easy and simple tricks to maximise your selling price. Best of all, they don’t all require major investment. Whether you’re working with what you’ve got or hiring the furniture and home décor items in, take the season into account when staging your property for sale. In Winter this means comfort, warmth and a sense of welcoming from the outdoors. Light and bright: choose light, neutral colours where possible. Think warm and cosy - add texture with throws, pillows and rugs. Velvet and wool are so on-trend right now and readily available. Make the master bedroom luxurious. Who doesn’t love climbing into bed on a freezing night? Channel a luxury B&B - invest in some great sheets, some plump Euro cushions and a luxury throw for the end of the bed. Little details like this get noticed by buyers. And the bathroom too! Add a glossy inside plant in a beautiful planter, light candles by the bath and have new fluffy white towels. Make your dining space welcoming - a medium sized vase with simple flowers, a great metallic tray with candles of varying heights, even some simple ceramic vessels of differing heights. It all paints a sense of occasion, important even in Winter. Don’t forget the laundry! We all know how out of control the laundry can get when clothes can’t be hung out to dry. Make sure yours is well organised and inviting. A great tip is to invest in dryer balls - a few drops of essential oil added before you turn the dryer on for a few minutes will have your laundry smelling beautifully fresh and inviting for Open Homes. Say welcome with style - the front door is where it’s all at. Refresh any potted plants. Get a new doormat. Consider updating your outside light, and definitely look at painting the front door if it’s looking a bit shabby. Think about what happens when they step inside. Is there a wonderful rug to keep their toes cosy? Somewhere to hang their coats? Bring the outdoors in. At least one bunch of simple flowers is a must, but be inspired by your own garden or neighbourhood too. A few great bud vases on a windowsill or even by the kitchen tap go a long way – even better: they don’t demand expensive foliage - simple greenery and single flowers will do. Look outside. Just because it’s freezing outside, don’t forget your outdoor entertaining areas: waterblast and sweep, assess the mildew/moss situation. Make sure all outdoor lights are working and that the gardens when viewed from inside are neat and tidy. You might be selling an investment property but you want your property to be attractive to homebuyers too. Why? Homebuyers are generally more emotional when buying their home compared to investors and therefore can attract higher prices. Get the carpets professionally cleaned and either refinish or polish the floor boards. 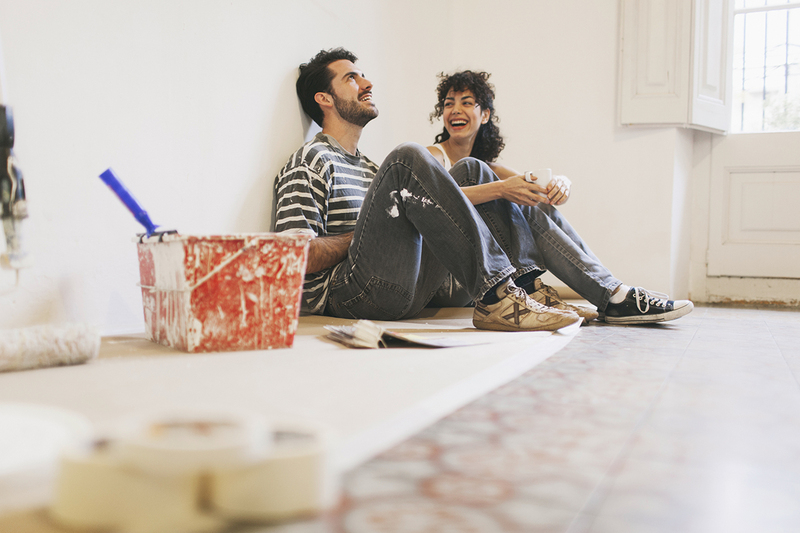 Walk through your property and give an honest appraisal on the state of the paint job. Look up! Do an honest appraisal of the ceilings, door and window frames. Skirting boards are one of the first places to show signs of wear and tear. Paint is one of the best value mini-makeovers around. Clear the decks! Clutter is the last thing home buyers want to see. Let them see the spaces for what they are by getting rid of anything unnecessary or highly personal. Tidy up the garden, especially the front yard and entrance area. Front yards, in particular, are important because they are often the first aspect of the property that potential buyers will see. Drippy windows? Make sure you wipe them daily or invest in an air filtration system that takes the problem away completely: it’s a great chattel to be able to list too. Waterblast/clean the outside of your home too, including the guttering and driveway. The difference this makes can be amazing - and instantly looks well maintained. Just like moths, humans love natural light: so the more natural light you can let in, the better. This is tougher in Winter, but still doable. Refresh darker curtains with lighter ones if budget allows. At a minimum, ensure they can be drawn right back to let every inch of Winter sun on offer in! Remember that dark, heavy curtains can also make rooms look smaller. Make sure that windows are sparkling clean to let in all light possible. Turn on all the lights and lamps before Open Homes, using the dimmer switch if available to add atmosphere. Mirrors are your friend. They bounce available light around and instantly make rooms seem bigger. This one is a no-brainer. There is nothing worse than walking into a freezing cold home on an equally freezing cold day. It won’t help make a good first impression for potential purchasers: in fact - it will probably stop them seeing your property’s great features because if they’re cold they’ll just rush through and see dollar signs in front of their eyes for investing in insulation and heating. Ensure that before the open homes, the heating has been on for a while and is able to be felt in every room – that includes bathrooms. Turn heated towel rails on and close the door, opening just beforehand. If you have a fireplace, light a fire and ensure it’s well stoked - with a neatly piled wood basket close by. Nothing says ‘cosy comfort’ in Winter better than a fire. Crank up the heatpump then before the Open Home starts change the setting to a subtle low. If you really want to impress, offer a warm drink to your prospective purchasers. Have some plunger coffee ready to offer people looking through your property, or why not crack open the whisky or red wine too for evening viewings! We all like to hibernate. So whilst evening viewings may not be as popular, make sure you plan for them. Just because there are fewer properties competing with yours, doesn’t mean you shouldn’t be flexible for viewings. Every time of year has good and bad points when it comes to selling property but make the Winter season work for you, and it won’t matter when you sell.